Located in the city of Mianzhu, Sichuan province, the China Rose Valley is a modern agricultural and rural tourism park jointly constructed by the Beijing Silver Valley Group and the local government. With a total investment of 20 billion yuan, the China Rose Valley will be built in three phases from 2017 to 2032 and is expected to become a popular global tourist resort, said Qiu Shizhong, assistant president of the Beijing Silver Valley Group, during a group interview on Aug. 3. 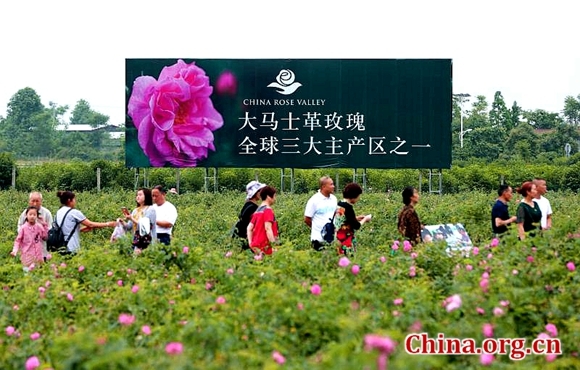 With the plantation area of Damask roses totaling 533 hectares, the China Rose Valley is the largest Damask rose garden in China and among only three Damask rose production areas around the world, Qiu noted. A sustainable industrial chain featuring R&D of roses, seedling breeding, plantation, and sales has been developed at the valley. The production line of essential oils, dried flowers, and food has been put into operation, with beverages and cosmetics launching soon, according to Qiu. The State Forestry Bureau approved the construction of the China Rose Valley as a national forest park on Jan. 25, 2018. From April to May this year, when roses blossom, the park received 500,000 tourists, according to its management committee. The Eighth China Rose Exhibition will kick off at the China Rose Valley on Sept. 28, said Li Yunzhong, director of the China Rose Valley construction office. Jointly held by the World Federation of Rose Societies, the China Flower Association, and the Mianzhu local government, the one-month event will showcase 450,000 pots of over 3,000 varieties of Chinese roses. Around 30 cities across China, including Beijing, Shanghai, Shenyang, and Nanjing will take part in the event and present distinctive exhibitions, said Li. 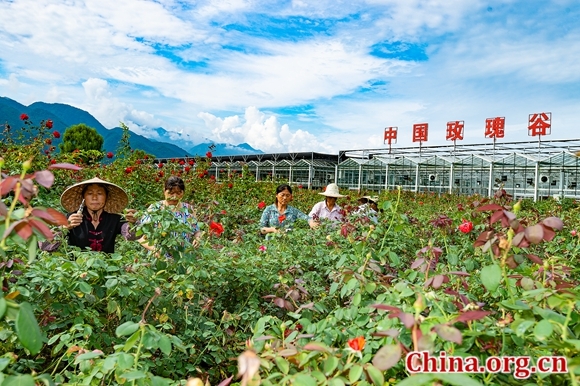 "The rose industry has not only improved our living environment, but also increased our income greatly," said a smiling Yang Youjin, a local resident. The valley is now negotiating with renowned perfume enterprises in Germany, Italy, France, and Bulgaria to be the raw material supplier, said Qiu, confident about the valley's potential. Located in the city of Mianzhu, Sichuan province, the China Rose Valley boasts the country's largest Damask rose plantation area and aims to be a popular destination for both local and international tourists.